If you’ve been keeping up with things you know that it’s the goal of Monsanto to control all the seed. If they have their way — which they’re good at getting since they have a revolving door with the government — natural seeds will be virtually extinct in time. When I found that out about 3 years ago I started growing all my vegetables from seed. And I’m saving as much seed from those vegetables as I can. I’m still experimenting with growing onions from seed — so I’m also buying transplants since I grow about 1500 onions each year.. Several of the varieties that I’ve grown and loved for years are now exclusively owned by Monsanto and I will no longer buy them. Bottom line — I see the hand writing on the wall and am doing everything I can to make the jump to raising all 1500 of my onions from seed rather than transplants. Since I’m not set up to grow seed inside under lights, I start all my seed via the wintersown method. Several varieties of onions I planted this year didn’t do as well as they did last year. I’ve already planted again — so I’ll get another shot at it. The Copras really did wonderfully. When I pulled these tiny little plants (only about 2 or 3 inches tall) apart to transplant to the garden, I was amazed at the strong root growth! Look at how long the root is on this tiny little onion! As I transplanted I wondered if these tiny onions would obtain full size. It’s hard to believe that decent sized onions can come this year from these little things. Fortunately for me, I have an internet friend who although she only grows a couple of hundred onions each year — she always raises her onions from seed. I’ve seen pictures of some and she has the biggest onions I’ve ever seen. “Yes, they’re small, they always are from seed, but that doesn’t mean a thing by harvest time. You’ll have to trust me on that. The seedlings are kinda like a blade of grass, I guess. Don’t let their small size fool you! I planted mine on 6″ centers (6″ from each plant), this year, but I have planted them as close as 4″ on center. The first month, mine just set there looking frightening when I plant them out in the garden, and then as if on cue, they start to grow. This is the picture my friend sent me of her baby onions raised from seed inside under lights. These are some of my baby onions still in the jug and outside. The tops are a little shabby looking but that won’t hurt them any. It’s interesting to note that when I planted my ordered transplants — they too sit there for about 2 to 4 weeks putting down roots and getting established. I hope to have new ones sprouted and in the ground by the 3rd week in April. As far as my experience has been — that’s late for onions BUT I trust what my friend has told me. And it could be that growing your own from seed gives them an edge to grow bigger and better more quickly than transplants that someone else grew. These tiny onions have stronger roots on them then any transplants I’ve ever ordered. Onions – Why Grow A Lot? All content including photos is copyright by TendingMyGarden.com. Theresa, You must be a fly on the wall at my house! I’ve been wondering aloud about my tiny onions too. My seedlings look exactly the same as yours. I planted them out last Saturday, and they look totally pathetic. I also did shallots and they look the same – just like weak blades of grass. I am very encouraged by hearing this from someone who knows. It’ll be interesting to see how this all turns out – especially the April ones. Keep us posted. THIS is exciting! I can’t wait to hear how this works out!!! I’d love to do this too!!! Go Go Go! Sandra, I’ve been very anxious to get this post up because I figured lots of us would have the same concern. I’ve received several emails from readers saying that their onions did not do well. I’m guessing they did fine but the grower was like me and didn’t know enough to know they were doing fine. I can hardly wait to see mine grow. Mama Bear – this will be perfect for you because you are so good at starting from seed and always have been. Alyona – did you have good drainage holes punched into the bottom of the container? I had a few wintersown jugs of onions that didn’t do very well either. Not sure just why. Yesterday — planted more via the wintersown method. I’m always concerned that if I plant them directly into the soil I’ll loose track of them. I’ll keep trying until I get it right. No, drainage was ok in container, I don’t know what happened. We had a lot of rain. This information is so helpful. The pictures are fabulous. Don’t know why that would happen Alyona. Not too much rain gets into the opening on my jugs, so I guess it was just an odd happening. Keep trying! In this case Sue — pictures are definitely worth a thousand words! Glad it was helpful. My bunching onions that I started from seed for the first time using the wintersown method looks a little worse than the third picture. So, I’m really glad to know that I am doing OK.The pics are so helpful for comparison. Aparna, my bunching onions that I started via wintersown also look a little worse. Overall, the bunching onions are a bit “thinner” than the regular onions. I think they’ll do fine anyway. Let me know how you do with them. Thanks for the inspiration to give onions from seed a shot. I planted a few hundred white sweet Spanish the day after i read this post and they’re up and growing well. Should be interesting to see how they compare with all the Dixondalefarms transplants, I set out about a week ago, come harvest time. Judging by the root systems on these little guys, I think this is going to be another “experiment” well worth the effort and something else I can do each year to save a few more bucks! With all the tasks that come with growing a large garden, the thought of seeds onions never really came to mind. Thanks again for the post and please keep em coming! I owe you some garden pics at the very least!!! Jack, I was delighted to get your report! I’m going to look forward to your pictures. I think we’ll have to wait a bit longer for our seeded onions. The Dixondale Farms transplants will finish sooner because they had a head start. And I agree – I think this experiment will be well worth the effort. Thanks for letting me know that you took action when you read the post! Theresa, how did the onions you started early last April do? I just found a couple of packets of onion seed I ordered last fall that I had forgotten all about. I suppose it’s too late to try to start them though. Heather, onions did ok, but starting earlier is better than later. January is the time to start them (at least in our area of the country). If I were you I would go ahead and get those onions started. 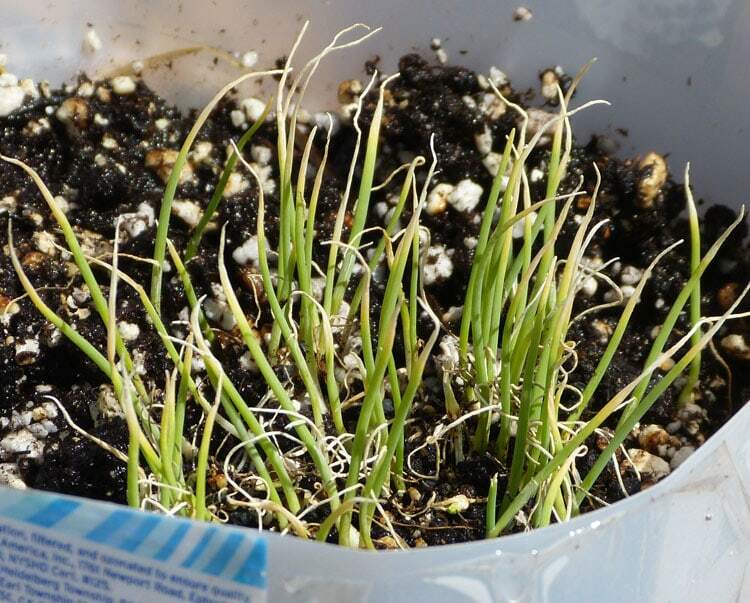 The worst you could get is spring onions or sets that can be planted either in the fall or next spring. 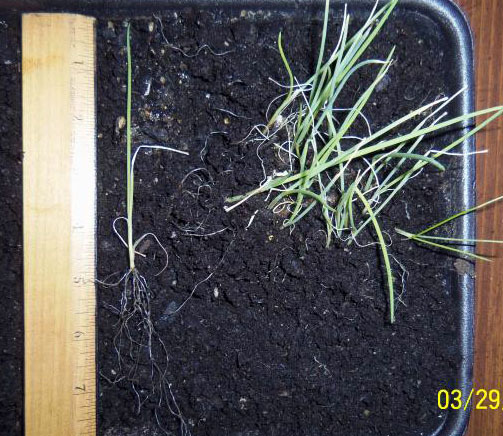 Viability of onion seed is best the first year, ok the second and declines rapidly thereafter. Update on the white sweet Spanish I planted from seed back on 4/4/13. Although the WSS Looked like mere blades of grass when they went into the ground, they actually finished out @ nearly the same size as the DD transplants! This year, the only seed that turned out to be viable were the Copras which were planted back in Feb., they’re looking great! Got them all in over the weekend. In the spirit of experimenting, I planted a few hundred each of Stuttgarter sets, Dixondalefarms transplants and these Copras. The outcome should be interesting! Hoping to grow all of the onions from seed, going forward. Fedco sells an open pollinated og variety of seed called clear dawn, which was bred out of the Copra. Supposedly stores very well (10 months) and at 8-10 ounces is just a tad smaller. Ever heard of this variety? Congratulations on great job of growing from seed, Jack! towards having my own onion seed. The hand writing on the wall is clear. I definitely will let some Copra seed this year. Again, great job Jack! Proud of you! Keep in mind that viability of onion seed decreases with each year. On an average it’s much lower the second year and decreases dramatically after that. Theresa – I still haven’t started my onions! At this point, to get sets for planting later, would I just direct seed into the garden, or start inside since soil temps are not that warm yet? Then when would I pull the sets, and when would I replant? Thanks. To get sets for planting later (or to get great spring onions) you can either direct seed into the garden or start the seed inside. I personally would lean towards starting them inside where I can keep a close eye on them. Once the germinate of course, they can go outside right away. Let them get a little growth on them and then transplant to the garden. 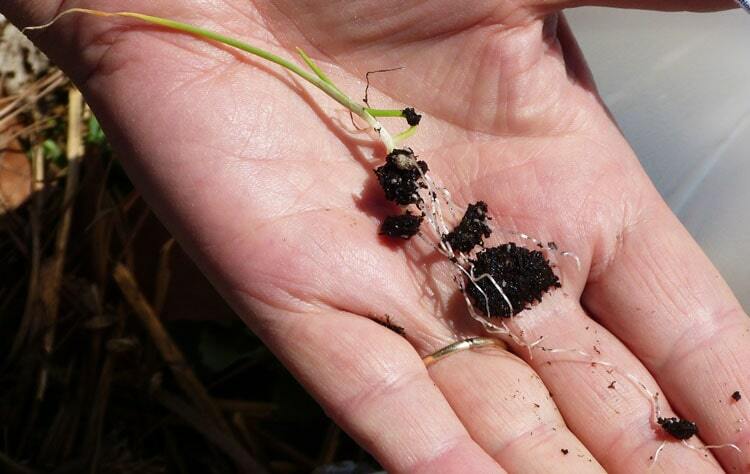 Are you still recommending starting onion seed about week 2 of January? I will be using grow lights. How deep should the starting tray be with soil medium? I usually have the soil medium about 2 inches thick if I’m short on grow mix as I am this year. I really like 3 inches even better. Good Luck with them Steve! Yes I am zone 5A some say, others say 6. I truly value your time spent sharing with us. Thanks for directing me to this post, Theresa. I guess the more I read, the more unnecessary worries I start to dream up. As I read this, I could easily remember how well my onions grew in years past, and they were just tiny little blades. I’m off to plant!! !